Interior Construction Specialist with Layton Construction contracted Ground Penetrating Radar of Salt Lake City, Utah to locate any reinforcement in a parking structure slab before they core drilled to install new fire features. Using the best concrete sonar technology, GPRS was able to locate all reinforcement in a 2’ x 2’ area around the proposed coring location. With this information ICS of Layton Construction can make an informed decision on the best location to core. ICS of Layton Construction realizes the benefit of ground imaging technology and works closely with GPRS of Utah. Ground Penetrating Radar Systems - GPRS of California was contacted by Arcadis to perform a concrete x-ray in San Jose, CA by using GPR technology. 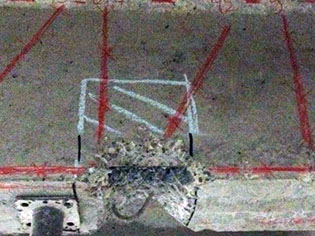 Concrete scanning was used to check the concrete walls in several areas in order to locate rebar. GSSI GPR equipment was used to locate rebar in every location that was scanned. The data is able to be marked directly on the surface with no wait time for processing or developing. Ground Penetrating Radar is a great tool to clear areas of utilities and conduits prior to core drilling or saw cutting. The concrete imaging process is entirely non destructive and free of radiation or health hazards. Ground Penetrating Radar Systems – GPRS of California was contacted by Arcadis to perform a concrete x-ray in San Jose, CA by using GPR technology. Concrete scanning was used to check the concrete walls in several areas in order to locate rebar. 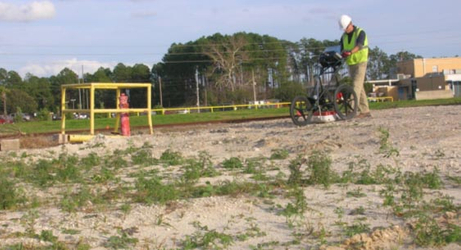 GSSI GPR equipment was used to locate rebar in every location that was scanned. The data is able to be marked directly on the surface with no wait time for processing or developing. GPRS works in San Francisco, San Jose, Sacramento, Fresno, and all surrounding cities. To locate rebar, post tension cables, conduits, pipes or utilities in concrete, please contact Ground Penetrating Radar Systems (GPRS) to learn how we can assist with your project. Prior to digging, trenching, and excavating, it is essential to know where underground utility lines are running. Ground Penetrating Radar Systems of North Carloina was locating a power line before trenching was preformed. GPR is a great tool to locate underground utility lines including electrical and telecommunications conduits, water and irrigation lines, sewers, and other obstructions. GPRS Project Managers can help you locate underground utilities on your job site, keeping you and your crews safe and productive while safeguarding the assets of your customers. Mitch White is the GPRS contact based in Raleigh, North Carolina and he can be reached at (919) 671-9476 or by email at mitch.white@gprsinc.com. Ground Penetrating Radar Systems (GPRS) of Texas office was called by EE Reed Construction to mark and locate any underground utilities in Sugar Land, Texas. Within 24 hours, GPRS mobilized to the site using the 400MHz Ground Penetrating Radar antenna, designed by GSSI, and RD7000 to safely locate all underground utilities. This innovative GPR technology has virtually no radiation producing less than 1% of a cell phone’s radiation. Nate Loyola, project manager on site, marked directly on the grass with spray paint. GPRS is a safe, accurate, and effective method to locate underground utilities on private properties. Ground Penetrating Radar Systems of Texas was recently called out to a private residence in Fairview, Texas. The homeowner wanted to know where his septic tanks and lines were located. Using GPR technology is a great dig-free method of finding underground storage tanks, septic tanks, pipes, and other buried utilities. By using GPR technology, Corey Brecht, Regional Manager for North Texas, was able to successfully identify the septic tanks and other buried utilities. To find out how Ground Penetrating Radar Systems can help you find your buried utilities, storage tanks, and septic tanks. Contact Corey Brecht at (972) 922-0223 or corey.brecht@gprsinc.com. Ground Penetrating Radar Systems was asked to assist in an office building renovation in Atlanta, GA. Our client needed to cut out a large section of the concrete slab on 4 floors to install a new staircase. We were asked to determine the position and spacing of reinforcing steel within the concrete slab, beam and joist positions, and we were also asked to determine the existence and position of live electrical conduits in the floor. 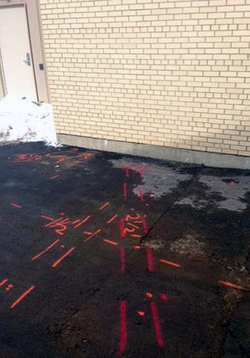 GPRS was able to complete the requested scanning quickly and efficiently, and our client was able to cut several large holes in a concrete slab without striking any conduits. Ground Penetrating Radar Systems, LLC. - GPRS of California was contacted by SCE to perform a concrete scanning “x-ray” in Los Angeles, CA. Concrete scanning was used to check the concrete slab in several areas in order to locate rebar and electrical conduits, prior to core drilling. GSSI GPR equipment was used to locate rebar in every location that was scanned. The data is able to be marked directly on the surface with no wait time for processing or developing. Ground Penetrating Radar is a great tool to clear areas of post tension cables, rebar, and conduits prior to core drilling or saw cutting. The concrete imaging process is entirely non destructive and free of radiation or health hazards. Ground Penetrating Radar Systems, LLC. was contacted by a contractor that needed to know the location of utilities prior to excavation earlier this month. The client's primary concern was to determine the location of any utilities or other near-surface items within the excavation area prior to digging so that they could either relocate either the excavation area, or the utility lines. The project consisted of clearing three 20’ x 20’ areas. Utilizing the latest in GPR and Radio Detection technology, Joe Bernarducci of the New York City Office scanned the site and was able to mark out several utilities traveling through the proposed areas. All of the utilities that were located were then marked directly onto the service in real time while GPRS was on site. The use of ground penetrating radar allowed the client to stay safe while digging and helped to keep them on their tight completion schedule. With the professional services provided by GPRS, no utilities were struck during the excavation of the three areas allowing the client to stay safe on this project. When an electrical contractor needed to do core drilling in a post-tensioned slab they called Ground Penetrating Radar Systems. GPRS was able to accurately locate all the conduits, rebar, and post-tensioning and provide them with area where they could safely drill. Ground Penetrating Radar is a very safe and quick method to locate reinforcement in large areas where cutting or coring is necessary. Other services we offer are: underground storage tank locating, utility location, rebar locating, void location, and more. If GPR services are needed in Arkansas call Dave Schaff at (501) 251-4036 or e-mail at dave.schaff@gprsinc.com. WHY CALL GROUND PENETRATING RADAR BEFORE YOUR NEXT EXCAVATION PROJECT? The pictures you see below are from a local attraction in Orlando, FL. The demolition contractor was removing a curb when they unknowingly broke a main feed line for the sprinkler system. This would normally not have been something difficult to remedy. However, they did not know where the shut-off valve was for the system. With this problem hundreds of gallons of water were wasted and the ground will have to be repaired prior to work continuing. This is not an uncommon issue on job sites today. To cut cost contractors are performing site work, demolition and excavation without having a proper utility locate performed. Most argue that it is a private property and therefore the local “one-call” services will not perform the scan. This, however, is where Ground Penetrating Radar Systems really shines. We work in all conditions providing one of the most comprehensive and accurate utility locates available.